Professional chefs are notoriously bad at giving recipes for domestic kitchens. They are unable to think in small quantities for a start, they are maddeningly vague about times and temperatures, they use words which create total, unreasoning panic in the mind of the ordinary cook: déglacer, dégorger, tomber, revenir, beurre manié — no wonder we lose our heads. Just listen to the next big party you go to: a party where there are enough nice little things to eat has a warm, contented sound, a sort of purr, quite different from the harsh, strident noise where there’s nothing but alcohol and cigarette smoke. I’d love to go to a party catered by her; her “nice little things to eat” are all mouth-watering, and most are easy to do. 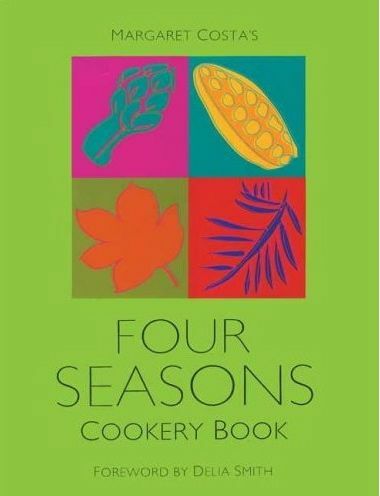 It’s a wide-ranging book, organised roughly by season (some dishes can be cooked all the year round though) — and within each season by theme. So Winter for example includes chapters like Christmas Classics, Party Pieces, Comforting Breakfasts, Winter Soups, Cooking with Wine (a sign of the 1970s that you had to have a special chapter for this! ), Proper Puddings, Marmalade … Costa is from the same school as Jane Grigson: erudition worn lightly, with unpretentious yet elegant and classic dishes covering the whole range from dinner parties through everyday meals to preserves and bread baking. Perhaps part of the reason I don’t use this book more is precisely because Jane Grigson is my first port of call when I’m looking for this type of book. Again like those traditional writers (Grigson, Elizabeth David, Patience Grey) this is a book you can read for sheer pleasure, even if you don’t cook a thing from it. The party pieces, the “proper puddings”, and the preserving chapters are the highlight of the book for me. So this post isn’t exactly a vintage feast, just a sampling of a couple of items from the book (which now sprouts a forest of bookdarts heralding future cooking sessions). I have never cooked chutney in my life, apart from a brief and fairly successful flirtation with mango chutney. This is possibly due to traumatic memories of a house reeking of vinegar from top to bottom when my mother was engaged in her annual days-long chutney-making session, during which the rest of the family would move out to the garden for the duration. So it’s perhaps surprising that the first recipe I chose from here was the tomato and red pepper chutney, from the very comprehensive preserving chapter. Partly because I bought a big bag of peppers from the market for 3 euros, partly inspired by the chutney-making fervour displayed at the Cottage Smallholder forum. Costa doesn’t weigh you down with instructions — she just tells you to mince or chop everything up, put it in a pan with the vinegar, sugar, and spices, and “simmer till thick”. The suggested 2 hours’ simmering stretched to 5 hours; I think my simmer must have been too low. But it did eventually acquire a jammy consistency, and I decided this was good enough. Into the jars it went, looking very convincingly like chutney. Verdict in a month or so, when it’s matured! Meanwhile, all the windows are open to eliminate the vinegar smell. While that was bubbling away, I made some Belgian bun cake, because I’d made some lemon curd a couple of days ago. This is basically a rich brioche dough, spread with lemon curd and sprinkled with candied peel and currants, rolled up and baked. It turns out like a lemony panettone, best eaten while still slightly warm and fragrant from the oven. 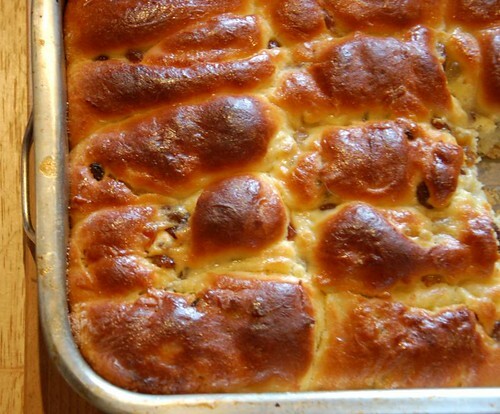 Delicious, and I already have plans for a very luxurious bread and butter pudding with part of it. I won’t give the recipe for the chutney here, because I’m waiting to see how it turns out. But here’s my version of the Belgian brioche. I made the dough on the dough setting of my bread machine, first warming the milk, sugar, salt and butter in a jug in the microwave, just enough to melt the butter. The dough ended up a bit sloppy and sticky, so if you’re going to do this I suggest checking up on it after 5-10 minutes and adding more flour if you think it looks too wet — it should still be a very soft dough though, not like bread dough. I just floured it liberally when I took it out of the machine. To make the dough by hand, warm the milk, sugar, salt and butter as above, letting it cool to lukewarm before adding to the dough. If you’re using fresh yeast, start it off in a couple of tablespoons of warm water with an extra teaspoon of sugar. Otherwise, just put the milk mixture in a bowl with the well-beaten eggs and add about half the flour and the yeast. Beat together well, add the grated lemon rind, and then work in enough of the rest of the flour to make a soft but not sticky dough. Turn onto a floured board, knead till smooth and springy, then turn into an oiled bowl, cover, and leave to double in bulk (about an hour, depending on how warm your kitchen is). Whichever way you made the dough, spread a large piece of parchment paper on your work surface and sprinkle with flour. Turn the dough onto it and pat it out into a rectangle about 35 x 20 cm. Spread generously with lemon curd and then sprinkle liberally with candied peel and dried fruit (I used currants, but I think chopped dried apricots or dried cranberries would be lovely). Starting from a long side, roll it up — this is where the paper comes in handy, because if the dough is sticky, you can use the edge of the paper to lift up the edge, unsticking it from the paper with a table knife as you go. Now cut the roll into slices about 2.5 cm thick. Butter a roasting tin about 20×30 cm, and pack the slices into it in rows. Cover with a cloth and leave to double in size again. Preheat the oven to 220C. Bake for about 20 minutes, till golden brown on top. Meanwhile, warm the milk and sugar for the glaze enough to dissolve the sugar. As soon as you take the brioche out of the oven, brush the top with the glaze to make it nice and shiny. Leave to cool and eat just warm. I bought this book because so many of my favourite food writers had said how it changed their lives and like you at first I didn’t “get” it . . . but sitting down and reading the book properly, the charm of Margaret Costa’s writing really shone through. It’s her narrative rather than the recipes that I enjoy . . . the section on summer strawberries is a rosy delight! What an enjoyable review, Veronica. I sort of agree with your attitude towards the pros, but why then am I absolutely addicted to Master Chef on TV in the UK. Love Michel Roux but I think he would be a hard task master! Having said that, I have grown a beard that is distinctly similar to his both in style and colour (over 55!). Thanks so much for your many mentions of Fiona’s site and the forum, to which you contribute greatly. We do hope you can make it to our meet-up next July. We both agreed that next time we want to spend more time with you. One of the outcomes of our inevitable post mortem! Danny, the date is already in my diary, even if you haven’t announced it yet 🙂 I would not miss it for the world! I find the Cottage Smallholder community constantly inspiring. Chutney update: the red pepper and tomato chutney is really nice, a bit mild but excellent on toasted cheese sandwiches. I’ll up the chilli content next time. Margaret,s Four Seasons has the best recipe for Hollandaise /Bearnaise I have ever tasted.It should be mandatory reading for every culinary student pro or amateur.Thanx and praise Margaret!